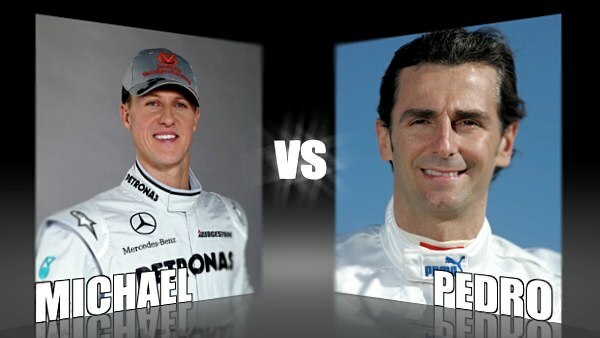 Character Cup 2010 - Round 1, Michael Schumacher vs. Pedro de la Rosa // How has Schumi's comeback affected his standing with F1 fans? Poor Sutil. You'd imagine that if he'd faced off against anyone rather than Jenson Button, he might have had a better shot at making it into the next round. As it stands, Jenson made the break, and so we turn our attention to the next matchup. This time we're looking at a multi-world champion who has made a rather lacklustre comeback, to a long-standing test driver who's trying his hand at a race drive. Love him or hate him, Michael doesn't do things by halves. Until recently, that is. The seven times world champion has created a massive fan following, both in Italy and his native Germany. Extremely passionate F1 fans hang on his every word. Equally, the man has created his fair share of naysayers, those who would question his every word. The comeback has not so far been successful, but how has Michael's character withstood the pressure? We've already established that Pedro doesn't do much to draw attention to himself, particularly when it comes to gathering points in Christine's Rankings. However, that doesn't necessarily reflect on his character. He does his job well and stays out of trouble, and he's been on hand as a test driver for a long time, arguably doing more for his employers than he does in the car itself. He doesn't have many enemies in the paddock, so he must be a likeable fellow. Will he get your vote?